PUBLIC ENEMY (1931) --- A spot-on classic. Never gets stale. The Movies by Griffith and Mayer had a story in pictures of this (above) that made me dream through sixth grade of one day seeing it. Public Enemy was probably the gangster show people remembered longest, Scarface and Little Caesar runners-up. Was it the grapefruit? 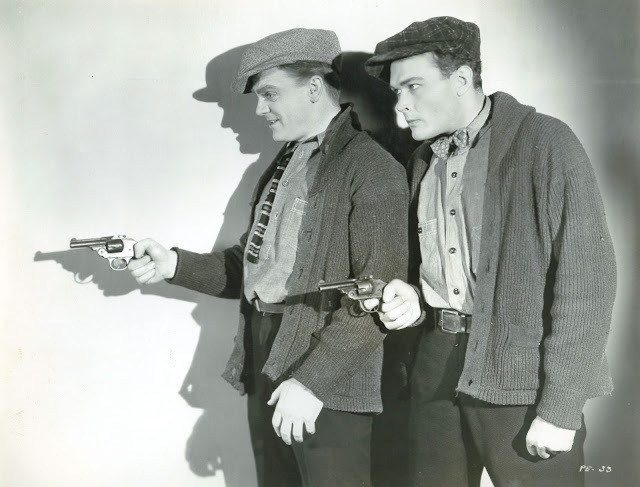 Hoodlums hopped up on Cagney and kin might have gone straight from Bijous to rob a filling station. Were censors right to say these pics were a bad influence? Always startled by how JC falls forward on his face at the end. Was that him or a dummy? Sure looks real. AMC recently ran PE in High Definition ... true HD, not a phony uptick like so-called TCM-HD. It looked great. Didn't mind the commercials and pop-ups so much --- this was Public Enemy in HD, after all. If proof is needed that Bill Wellman was a titan director, show this. Not a wasted frame. As economical a story-telling as there is in movies. How did Jim survive machine-gun bullets they fired into walls he stood behind? Nothing faked then. Oh, and AMC's was the ultra-precode version as opposed to 1954's reissue chop-up. 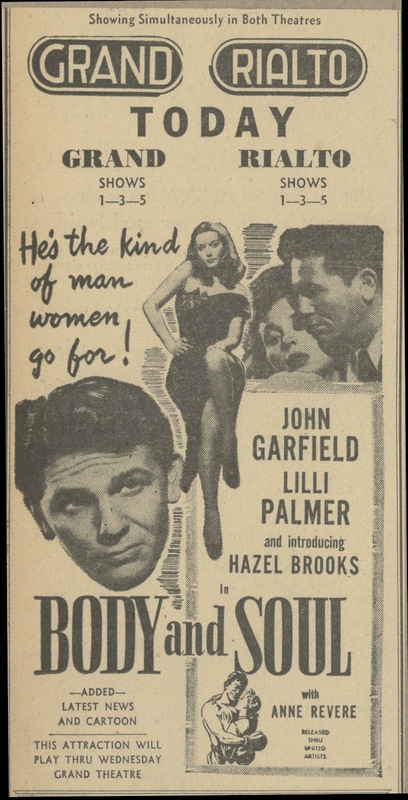 BODY AND SOUL (1947) --- Pro boxing is gang-dominated and stinks of corrupt $! Like, wow, I never knew that. Writer Polonsky and directing Robert Rossen wields narrative hammers as if no one did (many times) before. John Garfield is trailed by a "conscience" character (and writer stand-in) who dogs him like Jiminy Cricket, only minus the laughs. Guy finally gets his brains beat out, then walks in front of a cab. Wish it had been reels sooner. Garfield's great --- this would be a tougher pill without him. Ring action is saved till the final bout, a good thing. Jimmy Howe was said to have photographed fighters on roller skates, but I didn't see much evidence of it. A movie myth? Lovely on Blu-Ray. Thank you, Olive. CAROLINA BLUES (1944) --- Kay Kyser and the Gang head down-home to North Carolina, Kay's (on and offscreen) birthplace. He keeps a house and maid there even though he's on the road 364 days a year. The last Kyser band-fest, and it's for Columbia, not RKO. For a first time, Kay himself is bit by a love bug, but instead of Gorgeous Georgia Carroll, it's Ann Miller what wins him. Smooch scenes they do are awkward ... Kay's better yelling "Stoodents!" from the bandstand. Ish, Sully, and the rest lend music and clownish support. They're a big reason Kyser hung on big for so long. Girlfriend Ann's mother saw the group perform during WWII at UNC-Chapel Hill. Wish I'd been there. Excellent DVD from Columbia. 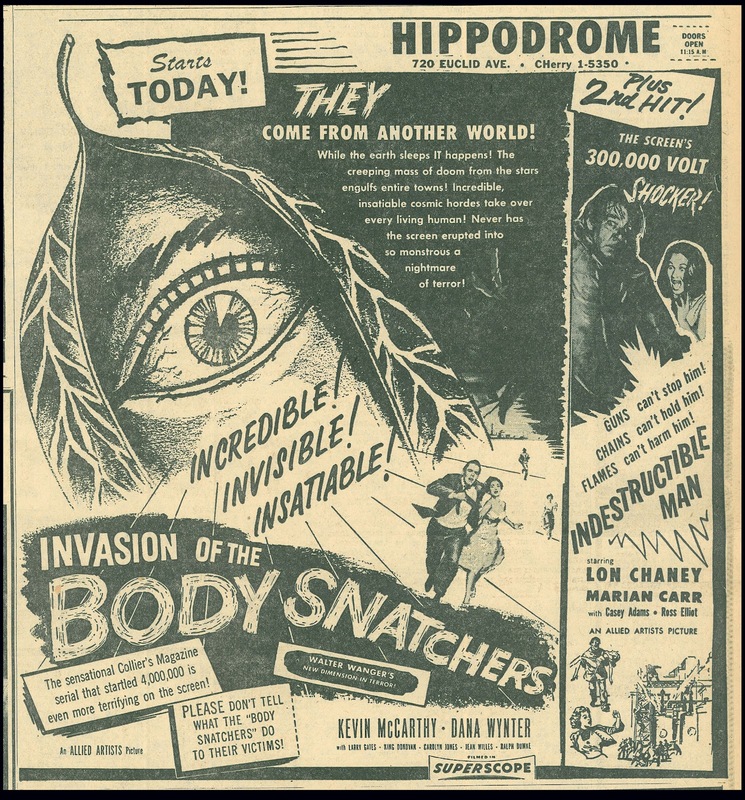 INVASION OF THE BODY SNATCHERS (1956) --- Overwritten about by multitudes, so I'll add little, except --- it's purely great. Never such a sock as now in HD and SuperScope. I drove Kevin to and from Greensboro airport when he did one-man Harry Truman at the Community College (1989), also had dinner with him. That's over six hours unfettered access! Stories he told about Merle Oberon (Hotel), Raquel Welch (Kansas City Bomber) were let's just say ... candid. First (and last) occasion I was around a star for so long. He signed my Invasion one-sheet too. How many people would recognize a pod if you brought one into a crowded room? Those were creepy props, especially with bodies forming in them. Some folks in Santa Mira might actually have been happier after giving in. Several offer Miles and Becky a pretty reasoned argument. Maybe the next remake will have populace lining up to become pod people. I'm of the camp that prefers wrap-arounds with Kevin and docs. That moment when Whit Bissell realizes he's on the level always gives me chills and a big lift. Maybe humanity can be saved after all! 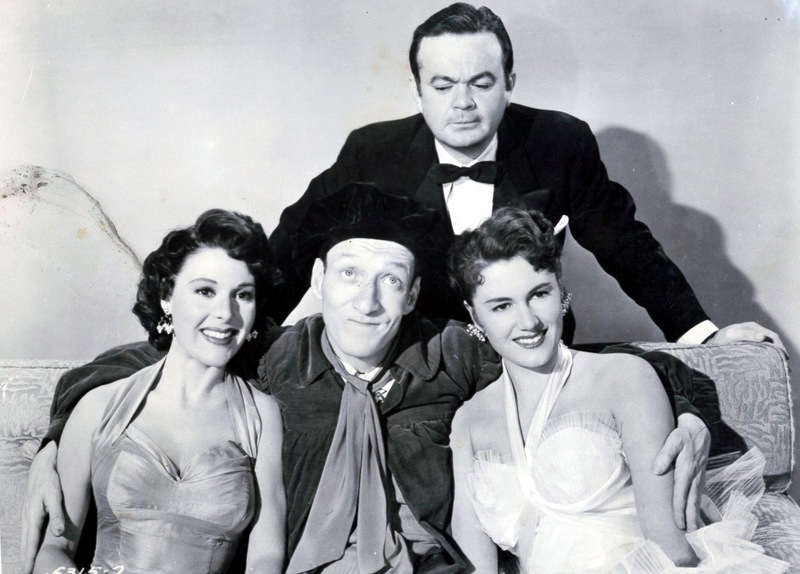 NO HOLDS BARRED (1952) --- Why did it take so long for me to realize what a comic genius Huntz Hall is? I'm chagrined for not watching these when Channel 8 ran them nearly every day. This is one of the best, so experts say. Huntz becomes a wrestle-champ. There's a ritzy party where he masquerades as an English butler and is an absolute panic. Did Huntz ad-lib this brilliant stuff? Give me him over Noel Coward any day. They do one exterior to startling effect, as BB comedies tend to stay indoors. I noticed members other than Gorcey and Hall hardly ever say anything. Were they muzzled by Leo/Huntz? Please TCM, keep showing these, or better yet, Warners, get out DVD box sets. 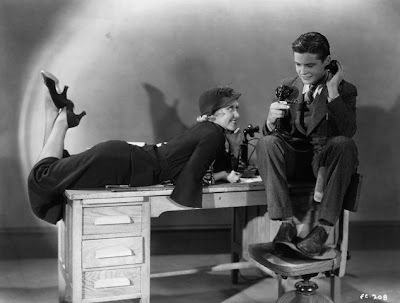 THE FAMOUS FERGUSON CASE (1932) --- Craven newshounds descend on a small berg when murder happens, Joan Blondell a chief "sob sister" who gets ethical and tears into rotten apple colleagues. Her big speech is a wow --- reminded me of Stanwyck/Davis blow-ups --- was Blondell inspired by these? Enough precode bon-mots to make me wish I'd brought a tape recorder. The rest of us spend lives wishing to be half so clever as these birds. I'd never seen Ferguson, which is to say it's great knowing there are more like it to treasure-hunt, and find. THE NAUGHTY FLIRT (1931) --- Alice White was a jazz baby that came along after audiences tired of jazz babies. Warners used, then discarded, her in early talkies. The Naughty Flirt is one, doesn't amount to much, but runs brief (56 minutes), a mercy. Scenes with White and supporting Myrna Loy make clear which will achieve lasting stardom. You wait for musical numbers that never come. Were they shot, then removed? Another where a simple misunderstanding eats up reels --- you wish someone would just speak up. Less pre-code than pre-good. 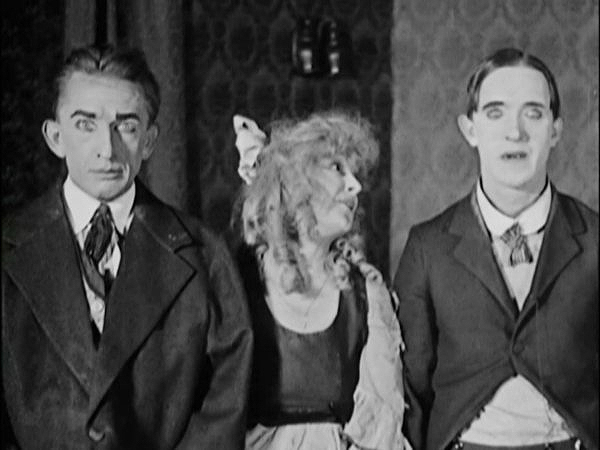 HUNS AND HYPHENS (1918) --- Larry Semon was a silent clown who fell in goo a lot. He came to movies from accomplished (print) cartooning and was another near-miss to slapstick greatness. LS should be remembered better, due to two-reeling that still pack wallops, that word not used inadvisedly, as Larry takes cringe-worthy punishment. Stunts look unreal for amazing stuff human bodies perform, but it's all Larry and superhuman company. Stan Laurel and Babe Hardy individually pulled time on the Semon squad. Huns and Hyphens was among Stan's first. He's in it little, but to good effect. Larry Semon went early (1928) to TB or pneumonia, take your reference pick. His was an oddball face and figure. One could have met Larry in church and pegged him for a silent comic. Huns and Hyphens might have been subtitled Flips and Falls, as both are there in abundance. 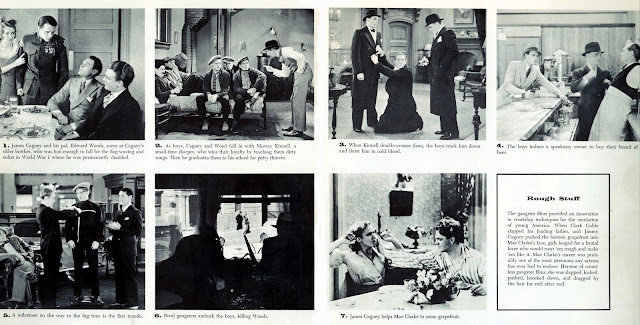 Part of the excellent Kino Stan Laurel DVD set (Volume Two). Your Kevin McCarthy meet and greet has me jealous - IOTBS has been an all-time favourite since my teens. I have a framed publicity shot signed by McCarthy and Dana Wynter, but I'd love to have met the man. Olive's Blu ray of IOTBS is an excellent upgrade over the horrid old Republic DVD, but it's a pity they couldn't drum up any extra features, given the film's classic status. Huntz Hall was a riot when he had material to riff on. There are times in certain Bowery Boys pictures where he throws the script away and improvises like crazy. He knows what to do, he knows where the props are, he knows which scripted gag lines have to be said... and then he takes off into uncharted territory, visibly amusing some of the other guys. Are you sworn to secrecy regarding the Welch/Oberon tales or what? Perhaps the skates were just to get him into position. Is that an Eyemo he's using? I can't watch any movie, any more, with commercials, and I'm of the generation that watched two hour movies chopped into ninety minute time slots with commercials. I wish AMC had put commercials before or after their films. Whatever they are doing seems to be working. Dan, I did the fast-forward through AMC commercials in "Public Enemy." It was worth it for the HD image quality. Mido, thanks for confirmation on Howe and the skates. Seems like I do remember seeing that still somewhere before. Chris and Dave, someday I may go into more detail about the Kevin encounter. It was quite an experience. He was a terrific person, and totally forthcoming about the career and folks he'd worked with. Scott, my impression is that Huntz Hall was a very bright guy. His face sort of belied that, but he sure made a comfortable living with it. Craig Reardon tells about a "Body Snatcher" location he visited. I envy you, Craig! According to Huntz Hall's son, Gary, now a rector of Bloomfield Hills’ Christ Cranbrook Church, no less a comedy expert than Groucho Marx once proclaimed Huntz to be "the American Chaplin," based on the B-Boys regrinds that were then proliferating the LA market in TV syndication during the mid-1960's. Son of Huntz also revealed his godfather was noneother than Shemp Howard, and had been a comedy mentor to his dad. I also saw the nice Columbia DVD release of "CAROLINA BLUES", which our local library bought. I understand it was at this time (1944) that Kay and Georgia Carroll were driving to a gig and decided to get married on the way! And they lived happily ever after for many decades! Actually I liked Kyser's RKO pictures best, but musical segments of CAROLINA BLUES were great. Did miss Ginny Simms, though! Stop me if I've told you this before, but... When I was born in 1956, there was a rule that babies couldn't leave the hospital until they were named. Apparently my family couldn't come up with anything appropriate. 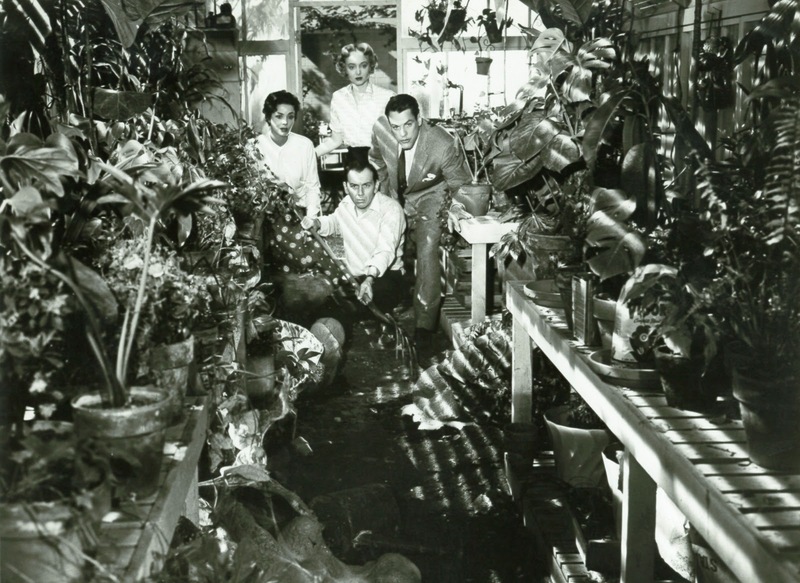 Then someone noticed an ad for Invasion of the Bodysnatchers, looked at the cast, and said, "What about Kevin?" Let me tell you, it's a cool feeling to be named after Kevin McCarthy in that movie. I only wish I got to tell him. What a great anecdote, Kevin! Thanks for sharing it. Wow....my mother told me pretty much the same thing about my brother. ...also born in 56.